The official size of a hockey rink is 200 ft long and 85 ft wide. The rounded corners will have a radius of 28 feet. The rink will be surrounded by "boards" made of wood or fiberglass which will be not less than 40" high, and no higher than 48" above the ice surface. The ice and boards will be white, except where authorized by the league, eg: board advertising and on ice advertising. Around the entire length of the boards there will be a yellow kick plate. The net is placed in the centre of a line 2" wide line and 13 feet from the back of rink and centered between the side boards.. This line extends across the entire width of the rink and up the boards and is commonly known as the goal line. The net is held in place by 8" yellow flexible pegs. 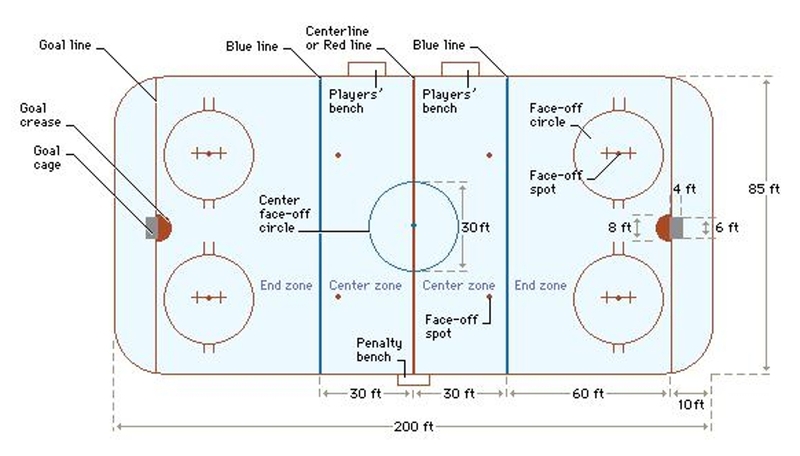 If the rink is longer than 200 feet, the goal line may be placed no more than 15 feet from the end boards with prior approval of the league. Two goal posts 48" high and 6 feet apart when measured from the inside and a cross bar made of the same material as the posts extends from the top of one post to the other. A white nylon mesh is attached to the frame of the net so that when the puck is shot into the net, the puck will not come out of the net. Around the base of the net is a white canvas skirt. This skirt has to fasten 6" back from the goal post and cannot prevent the puck from entering the net, and cannot be more than 1" higher than the base plate. The goal posts and cross bars must be painted red and all other exterior surfaces will be white. The area in front of the goal is an area known as the crease and is demarked by a 2" wide red line. The ice is divided into 3 parts by the two blue lines which are located 60' from the goal lines. Each blue line is 12" in width, and is painted across the rink and continues up the sides of the boards. The centre red line is 12" in width and is painted across the ice divides the rink into two equal halves. The red line is broken up in equal divisions, but has continuous edges. Exactly in the centre of the rink a 12" blue spot will denote the centre of the rink. Using this as a centre point, a circle with a 15' radius, and 2" wide blue lines shall be drawn. These are 2' in diameter and are 5' from the blue line. They are 44 feet apart and equidistant from the boards on each side of the rink. In each end zone, on both sides of the rink a red face off spot is marked. The circle is 2' in diameter. Running parallel to the end boards, a 3" wide line is drawn down each side of the face-off dot. Using the face off dot as the centre point, a face off circle with a radius of 15' is drawn with 2" wide lines. Two red lines are drawn on the outer edge of the circle to denote player positions during a face off. These lines are painted parallel to the goal line at the points on the circle that are closest to, and furthest from the boards. The lines are 2" wide, 2 feet long and 3 feet apart. Hash marks are drawn on the ice to denote the position of the players who are taking the face off.